Since March of this year, I’ve been working with Billy Kahora at Kwani Trust as Associate Editor on a new literary prize for unpublished fiction manuscripts. Offering cash prizes totaling 525,000 Kenyan Shillings, the Kwani? 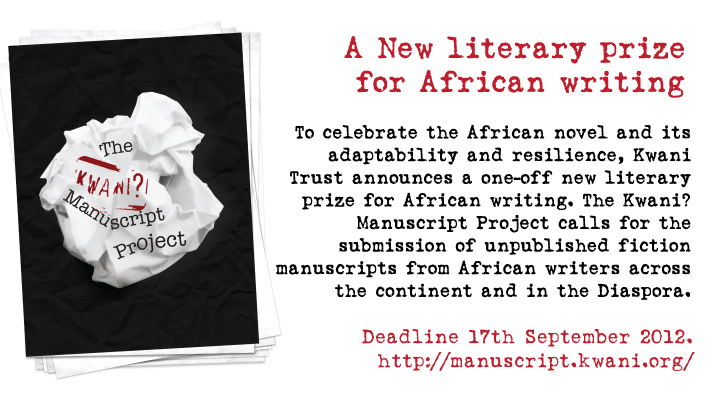 Manuscript Project calls for the submission of novel-length manuscripts from African writers across the continent and the Diaspora. With just two weeks to go until our 17th September submission deadline, I thought it was a good time to share some thoughts and reflections about the prize – and see if through Africa in Words we can spread the word and encourage more submissions. Kwani Trust was established in 2003 and through its flagship magazine Kwani? and regular literary events has been developing new voices and forms of writing from Kenya and Africa. However, as Managing Editor Billy Kahora has admitted, Kwani Trust have yet to publish novel-length material that competes on a continent-wide or international stage. This prize is therefore about using the work Kwani Trust done over the last 10 years as a platform for now filling that gap. The Kwani? Manuscript Project was launched to both nurture and uncover original and new directions for the novel. The prize not only gives writers a cash incentive to complete and hone their manuscripts, but also promises opportunities for publication by Kwani Trust as well as regional and global publishing houses. Many of the most prestigious prizes for African writing, for example the Caine Prize or the Commonwealth Prize, are set-up and administrated outside of the continent. This new initiative should therefore be celebrated not just as an opportunity for writers to get recognition for their work, but as an opportunity to change the direction, structure and content of the conversation about the ‘Kenyan’, ‘Malawian’, ‘Liberian’ or ‘African’ novel. Over the last 5 months, following the launch of the prize in April, I’ve been working to make sure we reach out to as many writers as possible with news of the prize and to encourage submissions. We’ve tried particularly hard to ensure writers in countries where publication opportunities are fewer know about the initiative. We also been thinking about ways to support writers through the process of developing and submitting manuscripts for the prize, and had a great response to our series of specially commissioned essays by leading African writers on writing craft and practice. So far we’ve received over 130 manuscripts from 12 African countries, and are hoping to significantly raise both these numbers before 17th September. As the deadline approaches we will be launching a new series of essays asking ‘what is the African novel’, with contributions from Imraan Coovadia, Véronique Tadjo, Binyavanga Wainaina and Boniface Mongo-Mboussa. Look out for these provocative pieces which are very much intended to start a larger debate…and make sure any writers you know have their manuscripts ready to send to manuscript@kwani.org. Hi Kate. Lovely blog. I am just wondering; if I were to submit my story, when do I know about the long list and short list? Rather than waiting until the results are out, the two lists usually help writers decide whether or not to submit their work elsewhere. thank you for the good work you are doing to help writers hone there skills.How are competitors informed whether there work have been shortlisted or longlisted? i have a full-length novel manuscript to submit in the 2016 competition but am digitally challenged since am based in a remote village where i cant accese the computer to do the online submission.Kindlly assist me on onother alternative that my work can reach you.